CarGurus has 2,736 nationwide Verano listings starting at $3,999. For those who want to drive like an up-and-coming CEO but don’t want to pay like a corporate mogul, Buick’s 2015 Verano compact sedan might be just the ticket. Handsome, peppy, agile and well-appointed, this 5-passenger family-oriented 4-door will hang with just about anything in the compact Beemer, Infiniti and Lexus worlds while offering not only a livable MSRP, but a turbocharged engine option besides. Returning in 4 trims, the base Verano, the Verano with Convenience Group, the Verano with Leather Group and the Verano with Premium Group (a.k.a. the Verano Turbo), this classy conveyance is available only with front-wheel drive (FWD) and sports only a few noticeable tweaks for 2015. Said upgrades include GM’s touted OnStar-interfaced 4G LTE WiFi hotspot capability with a rather devious activation scheme, according to a few reviewers, as well as an available new Appearance Package for higher trims. Oh, and Buick's boo-boo in originally announcing the demise of the available 6-speed manual transmission in the Turbo/Premium Group has officially been rectified, thus the stick-shift version will stick around for 2015. Anyhow, all but the Verano Turbo/Premium Group remain powered by a capable if somewhat less-than-inspiring 180-hp 2.4-liter inline 4-cylinder (I4) engine that mates with a 6-speed shiftable automatic transmission for 171 lb-ft of torque and 1,000 pounds of properly equipped towing capacity at a rating of 21 mpg city/32 highway. For a bit more pizzazz (and more money) the 2015 Verano Turbo/Premium Group flaunts a 250-hp turbocharged 2.0-liter I4 powerplant that comes standard with the 6-speed shiftable automatic or with the still-available-despite-rumors 6-speed stick-shift gearbox. Look for 21/30 from the turbo 4, while towing is again maxed out at 1,000 pounds for those few who might be interested in putting on a hitch and wiring. Once again, 2015 Verano trims return pretty well equipped with, for instance, 18-inch polished alloy wheels, leatherette upholstery, full power accessories, cruise control, telescoping tilt-wheel steering, dual-zone climate control, a rear-view camera, rear parking sensors and 6-speaker audio with satellite radio and an auxiliary audio input all adorning the base trim. Oh, and OnStar Directions and Connections service now comes with the aforementioned 4G LTE WiFi capability with a 3-month, 3GB trial subscription and is standard in all trims. The Convenience Group, meanwhile, adds heated front seats and heated exterior power mirrors, as well as a remote garage door opener and auto-dimming rear-view mirror, while the Verano with Leather group throws in leather upholstery, a heated steering wheel and a 9-speaker Bose premium audio system interfaced with Buick’s touted IntelliLink infotainment display interface. Options-wise, the lower 2015 Verano trims can be delivered with available bling that comes standard in higher trims, while all but the base Verano are eligible for an available power sunroof. A Styling Package is new for 2015, too, throwing in a rear spoiler and bright chrome grille, along with a couple of unique exterior color choices. Finally, an available navigation suite can be integrated with the IntelliLink system, again in all trims but the base Verano. Of course, the 2015 Verano stable comes equipped with all the mandated safety stuff, like 4-wheel antilock brakes (ABS), traction and stability control, side-mounted airbags and head airbags, along with daytime running lights and front fog/driving lights. Additionally, this spiffy family sedan also sports a standard post-collision safety system and a remote antitheft alarm, while all but the base Verano will also tote standard forward-collision warning and lane-departure alerts, as well as blind-spot and rear cross-traffic warnings. 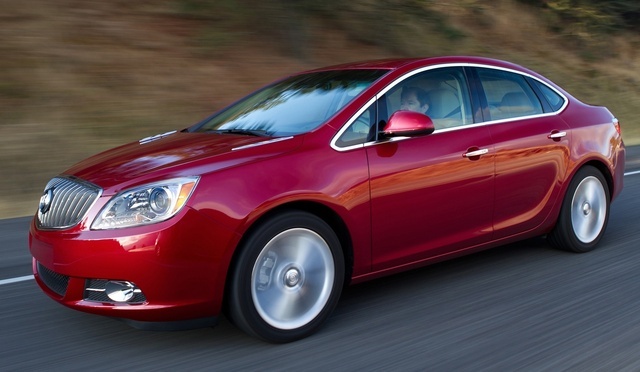 What's your take on the 2015 Buick Verano? Fsucks Bought one for a college student and three months later bought another one for her sibling. They love them! Quiet ride and full of safety features like rear view camera and my favorite , blind spot warnings. Have averaged 26 mpg in mixed driving. Their college age friends are impressed with these little Buicks! Users ranked 2015 Buick Verano against other cars which they drove/owned. Each ranking was based on 9 categories. Here is the summary of top rankings. 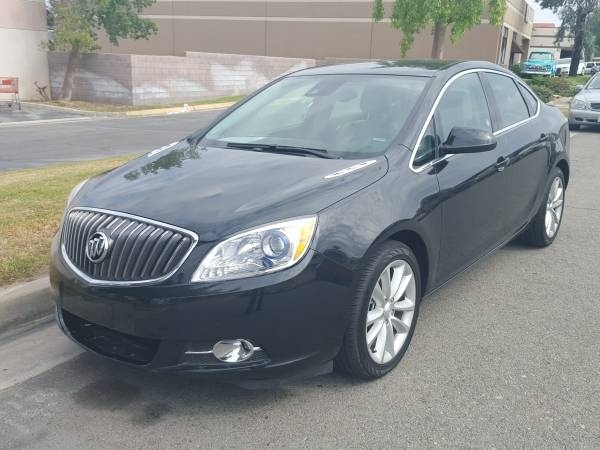 Have you driven a 2015 Buick Verano?